Western Unity and the Transatlantic Security Challenge * The defining issue of the 21st century will be whether the democratic community can prevent chaos along the strategic arc stretching from the Middle East to the Asian littoral. This Marshall Center Paper presents two different views of how Europe and America should respond to terrorism, globalization, and the proliferation of Weapons of Mass Destruction. Counter-Terrorism and the Use of Force in International Law * In this Marshall Center Paper, Professor Michael Schmitt explores the legality of the attacks against Al Qaeda and the Taliban under the jus ad bellum, that component of international law that governs when it is that a State may resort to force as an instrument of national policy. Although States have conducted military counter-terrorist operations in the past, the scale and scope of Operation Enduring Freedom may well signal a sea change in strategies to defend against terrorism. This Paper explores the normative limit on counter-terrorist operations. What Roles and Missions for Europe's Military and Security Forces in the 21st Century? * Military and other armed security forces in the 21st Century face an array of requirements quite unlike those of the past. Traditional roles, such as defending national territorial sovereignty, remain, but their importance will be attenuated, as more nations realize that their defense begins beyond their borders, and that security means more than just the military defense of territory and sovereignty. Police Primacy: The Challenges of Developing Host Nation Police Capacity on Stability Operations * Military forces are often essential to create the initial security conditions that allow the civilian components of a stability operation to build a durable peace, however, armed forces are not intrinsically suited to police work. Soldiers are trained to apply lethal force in war. Military force can have a deterrent effect on militias and criminal gangs, but sometimes the deployment of soldiers in a law enforcement role can lead to excessive violence, which invariably alienates the local population and can provoke armed resistance. Obama and the New "New Europe" * Where not simply eclipsed by the global financial crisis, turmoil in the Greater Middle East, and the "pivot" toward Asia, the Obama administration's relations with Central Europe have struggled to escape from the narrative of neglect (bordering on betrayal) that congealed during its first year in office. Though the tone of interaction is likely to remain less exuberant than in the recent past, both sides' evolving interests in Europe and beyond still stand to gain from mutual support. Balanced analysis and realistic assessments will be needed to achieve this. Taking off as a Global Power? China's Foreign Policy "Grand Strategy" * For better or for worse, China is becoming increasingly interconnected with the rest of the world. As recently as 1999, Gerald Segal raised a question of interest to all: "Does China Matter?" Segal came to the conclusion that "China matters far less than it and most of the West think, and it is high time the West began treating it as such." More than a dozen years later, however, the answer is very different: in the 21st century, there is no getting around China in international politics. 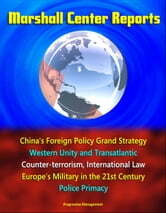 The question is not if, but how China will make its way to the top and become a truly global power. Smart Defense: Overcoming Hurdles and Passing Batons * NATO, the paradigmatic alliance, has embraced the new term "smart defense" as a sophisticated concept that captures the new way of doing business within the alliance. This article analyzes the concept of smart defense and explores possibilities for its successful utilization within the NATO context.